A stable strong economy can further be seen in the unemployment statistics of just 4% up from a low of 3.8%. However this will be one to watch as if unemployment keeps rising over the coming months to say 4.3% that could act as an advance warning of a recession some 6 months later. Whilst inflation has dipped back below the Feds 2% target at 1.5% hence the Fed's dovish comments. So the fundamentals are supportive of rising stock prices for 2019. The stock market is about 25% CHEAPER than it was a year ago. Recent history suggests a PE of 25 is a bit toppy, so not surprising that 2018 was a flat year. So 18 is supportive of rising prices for 2019. 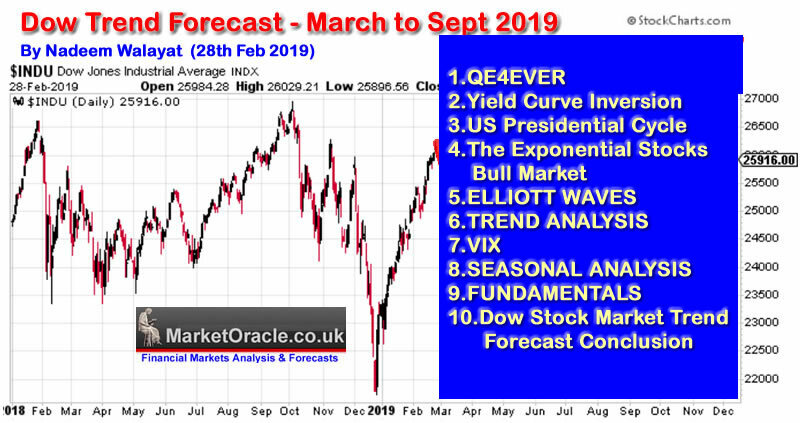 The article in this series concludes in a detailed trend forecast for the Stock Market covering the 6 months to September 2019.